Today, the educational institutions in Chennai remained closed as the Chennai district administration declared a holiday following heavy rains in the region. After the unusually hot October, Chennai witnessed heavy rainfall on Saturday and Sunday which inundated many low lying areas in the city. Gusty winds accompanied with rain uprooted some trees across the metropolitan. Traffic was thrown out of gear in some areas due to severe waterlogging. Poor visibility and rains affected movement of flights at the airport in Chennai today, with two being diverted to Bengaluru. Airport officials said a Sri Lankan Airways flight from Colombo and a Qatar Airways flight from Dubai, carrying 67 and 294 passengers respectively, were diverted to Bengaluru following poor visibility in Chennai. ….. that is all ordinary ~ a rare tropical cyclone has hit the remote Yemeni island of Socotra, killing at least one person before heading towards the Yemeni mainland. Many residents took shelter in schools and caves as the storm, named Chapala, brought hurricane-force winds, heavy rain and powerful waves to the island. It is believed to be the most powerful storm that Yemen has seen in decades. The UN's World Meteorological Organisation described the cyclone as "extremely severe", and said that sea conditions around the centre of the storm were "phenomenal". At 06:00 GMT on Monday, the US Navy's Joint Typhoon Warning Centre reported that Chapala was generating gusts of up to 240km/h (150mph), equivalent to a category 4 hurricane. Earlier reports suggested that Cyclone Chapala was heading for an extremely rare landfall at hurricane strength along the coast of war-torn Yemen. While wind damage will be a threat near the point of landfall, the bigger concern will be extremely heavy rainfall in a normally arid region, leading to life-threatening flash floods in a country already suffering a major humanitarian crisis stemming from years of violent conflict. Chapala was a Category 3 equivalent storm on the Saffir-Simpson Hurricane Wind Scale as of Monday morning (mainland U.S. time). It had rapidly intensified to a high-end Category 4 early Friday and remained in that Category through most of Saturday. This made Chapala the strongest tropical system so far south in the Arabian Sea on record. One would wonder for sure - how often "tropical cyclone" and the "Arabian Peninsula" appear in the same sentence. 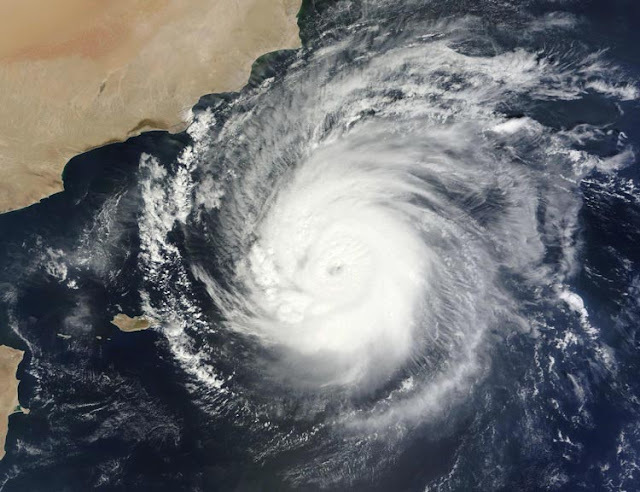 First, hurricane specialist Michael Lowry says the head of the Cyclone Warning Division at the India Meteorological Department cited two "severe cyclonic storms" - those with winds of at least 55 mph - made landfall in Yemen in May 1959 and May 1960. Weather Underground's Dr. Jeff Masters says Tropical Depression Three in 2008 claimed 90 lives and was responsible for $400 million in damage. However, there is no record of a cyclone of Category 4 strength or stronger tracking as far south as Chapala in the Arabian Sea. Despite all this, Arabian Sea tropical cyclones are not as unusual as they sound. Today’s news reports state that rare cyclone Chapala hit Yeman and was heading for al Qaeda run city. Amateur pictures and videos on social media, which could not be immediately authenticated showed torrents of water washing through the streets of the Socotra provincial capital Hadibu. "Three people were killed, around 100 have been injured," said a local official, without describing the causes of death. "Around 1,500 families have fled to the interior and to the mountains. There's absolutely no help coming from the outside." Chapala, a rare tropical cyclone, killed three people and injured 100 on the Yemeni island of Socotra Monday, and is headed for an Al Qaeda-controlled town near the port of Mukalla on the mainland. Situated in the Arabian Sea and slightly larger than Majorca or Rhode Island, isolated Socotra is home to hundreds of exotic plant species found nowhere else on earth. Its 50,000 residents speak their own language. Long remote, the island has become especially cut off from mainland Yemen by a seven-month war there between Iran-allied fighters and a coalition of Arab states led by Saudi Arabia. Yemen, generally arid and hot, receives relatively little rainfall and the infrastructure in the Arabian Peninsula's poorest country is ill-equipped built to handle large deluges. Slightly weakened, the storm is expected to hit the mainland on Tuesday morning near the port of Mukalla, which has been run by a tribal council and Al Qaeda militants since the army and government institutions withdrew in April. Forecasts late last week indicated the cyclone would strike the coast close to neighboring Oman's second city Salalah while avoiding populous areas of Yemen, which has never experienced such a storm. But its latest trajectory takes in southern Yemen, weakening as it bears down on the capital Sanaa in the north. Tropical cyclones in the Indian Ocean basin, which includes the Arabian Sea, are simply known as "cyclones" or "cyclonic storms" regardless of strength. There are no special terms applied based on reaching a certain intensity, but the India Meteorological Department does apply various adjectives such as "severe" or "very severe" to describe different intensity levels. 2nd Noc. 2015 @ 22.45 hrs.